Did you notice? Have you tasted it yet? 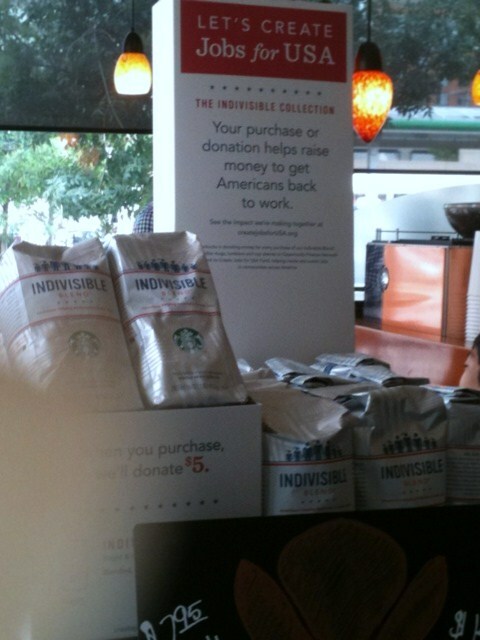 While others are writing about Starbucks serving beer and wine, we note that CEO Howard Schultz has upped the ante on his Creating Jobs for America corporate social responsibility (CSR) campaign by increasing the campaign’s visibility in stores, and even temporarily branding the effort with its own custom brew, Indivisible. 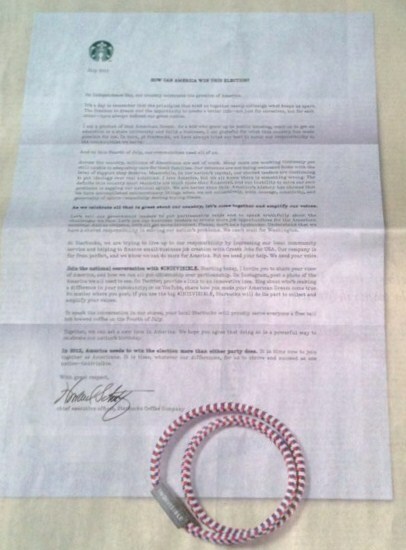 We wrote about this CSR campaign after it was launched in November, 2011. We can only repeat our endorsement of a program, and a movement, whose time has come. 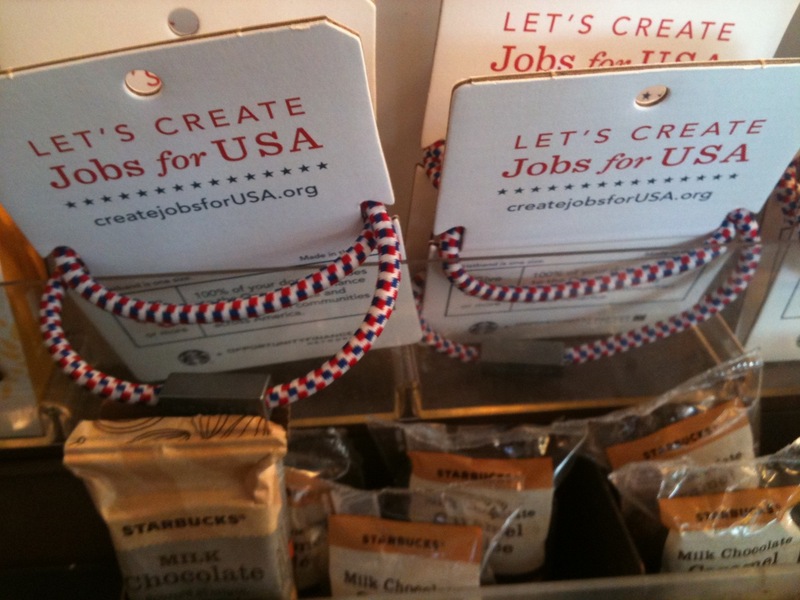 Since we first wrote about Create Jobs for America, Starbucks and its customers and partners have raised $11.5 million to help create jobs in the US. What’s even better is that the $11.5 million investment has been leveraged to generate more than $80 million in loans to help create and maintain jobs in underserved American communities. It should be duly noted that Starbucks and its foundation hasn’t accomplished this alone. Along with customers, other partners include Citi Community Development and Citi Foundation, which recently contributed $1 million to the effort, and the Opportunity Finance Network. In our earlier post we acknowledged Schultz’s chutzpah in launching this CSR effort by titling our post,“Putting His Money Where His Mouth Is …” Since then, it’s clear this has become an even more collective effort, sparked with a new burst of purpose and audacity. We’ve also blogged and tweeted about Panera Bread and its growing social responsibility experiment, the Pay-What-You-Can-Cafes. We’re very pleased at the announcement that they’re converting one of their restaurants in our own backyard (Chicago) to the pay-what you can model. We’ve said it warms our hearts when companies show that “they get it” by identifying signature corporate-giving-back efforts that not only advance their business model, but also address major social issues—in this case, poverty, hunger, and even job training. For more details, check out Panera’s website, http://paneracares.org/what-we-do/. A final note, while this campaign is new to us, Chevron recently garnered headlines for its “grow manufacturing jobs initiatives.” The “We Agree” campaign outlines the company’s social responsibility efforts on a variety of fronts, most particularly its $8 billion in energy production projects and jobs. Here, again, a highlight of the campaign is creating strategic partnerships to build collective action, and leverage resources for even greater impact. What do you think of these CSR campaigns? Heard about others? We want to hear from you. Write us with your feedback here, or send us a Facebook update or tweet, via this post. Amid the swarm of scandalous news of late–much of it involving leaders in government, major companies and organizations worldwide–a comparatively quiet effort has been taking shape, and growing, designed to bring pride, leadership and employment back to Americans. (We say quiet, because after an initial flurry, we haven’t heard much more about it in the news.) 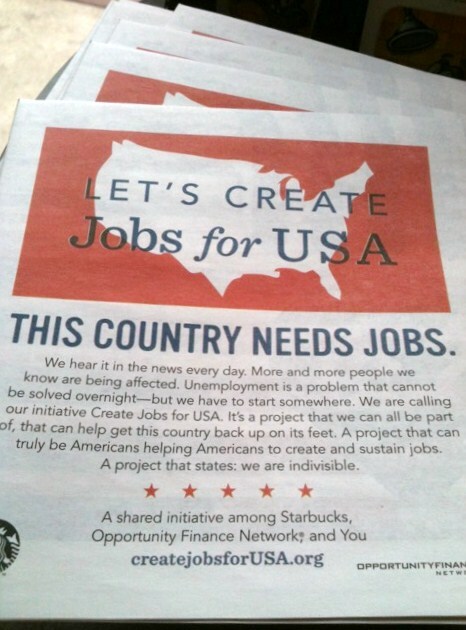 In fact, the Create Jobs for USA campaign spearheaded by Starbucks’s CEO Howard Schultz is a major bright spot is what appears to be the dismal landscape of corporate America. In our last blog, we called it a game-changer, because at least temporarily, it’s somewhat cooled the divisive political rhetoric and given us a cause nearly all Americans can champion. What began with a PR flourish (full-court newspaper and TV interviews, full-page ads, etc.) is now a bona fide movement and organization. To date, Starbuck’s and its partners, the Opportunity Finance Network, has leveraged more than $6.5 million for the admirable cause of putting American back to work. (The program was kicked off with a reported $5 million investment from the Starbucks Foundation and the rest has been raised from customers through the sale of colorful wristbands at $5 each. This money has gone into a revolving loan fund for small businesses and others providing community-based jobs. While Schultz and his efforts have come under some criticism from manufacturers (http://www.manufacturing.net/blogs/2011/12/does-starbucks-create-jobs-for-usa) and from unions re: barista wages, Schultz’s initiative and commitment to this larger cause should be commended. Yes, businesses and corporations do good things every day, and for that we can all be thankful: They provide jobs for people and philanthropy for the communities where they operate, and collectively they contribute to the health and well-being of our nation’s economy (for the most part). Yet, as we have seen, they can also do a lot of harm–need we even recite a list: BP, Countrywide, “Wall Street” firms, Fannie Mae, etc. Typically today, when a major company talks about a bold move, it’s in the wrong direction–layoffs, ethical lapses, political quick-fixes, and scandal-ridden operations. This has been an ongoing since at least 2001, seemingly since the bankruptcy of Enron, and no less likely, even before. While others may raise questions about the sincerity and commitment of Starbucks’s Create Jobs for USA–mind you, no corporate action impacting the public should go unscrutinized–we should also give kudos when a corporate leader stands up, takes on the prickly issues, and puts his money where his mouth is. Way to go, Howard!